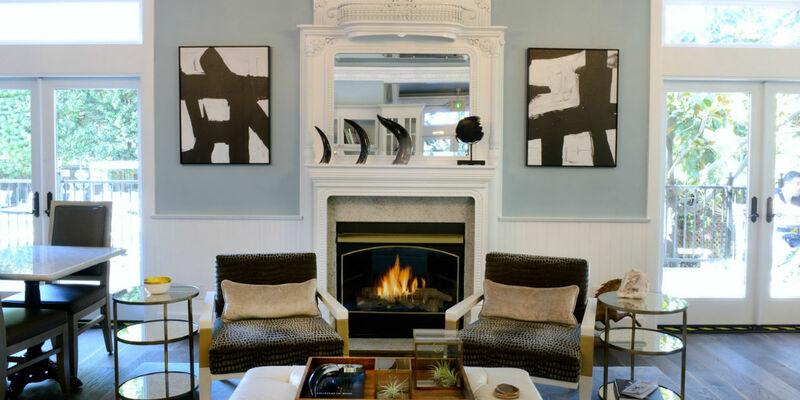 Downtown Napa’s White House Napa Valley Inn boutique hotel recently reopened with fresh details along with a modern, chic renovation of the historic inn. 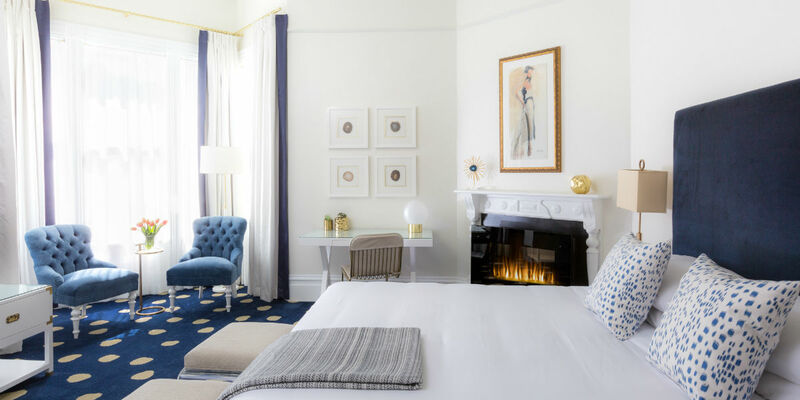 It may be a new look, but the warmth and charm of this old town landmark is still present, and with the dizzying array of resort-like amenities, White House Napa Valley Inn is a cozily luxurious alternative to a more sprawling lodging option. The 17 guest rooms feature unassuming historic charm and quirky design details. From the polka dot carpet, modern art, and the pop of color gracing every suite, you’re bound to find ample Instagram-worthy moments to document throughout your getaway. Natural light and high ceilings encompass each room creating an airy, open feeling to complement each thoughtfully executed design. Tech friendly amenities add to the modern updates and each room is outfitted with flat screens, Apple TV, free WiFi, and USB ports. While their plush beds may be hard to roll out of, the inn’s complimentary tapas-style breakfast of sweet and savory delights is worth the tumble down to the dining room. Insider Tip: Breathe in that fresh air and request a King Deluxe Balcony room for an expansive room with walk-in shower and a stunning shared balcony overlooking the front lawn. 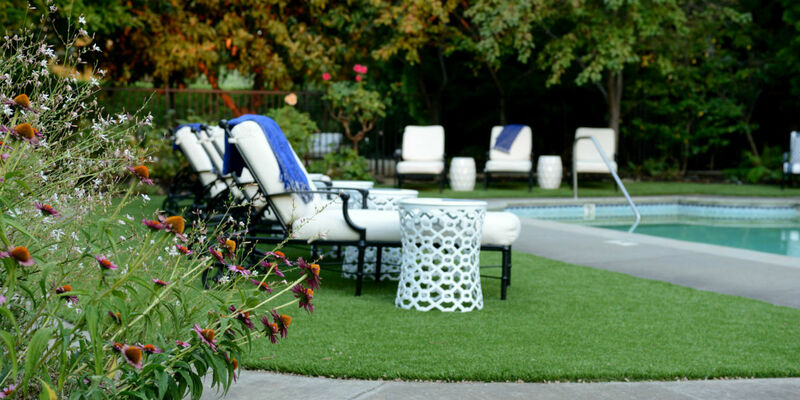 While the rooms are outfitted for ultimate comfort and relaxation, the grounds are equally an oasis in central Napa. Lush flower gardens surround the manicured lawn and private outdoor swimming pool and hot tub. Laze in one of their reclining chairs under the California sun or on those cooler Napa nights, sidle up to their outdoor fire pit with a glass of your favorite wine country libation. 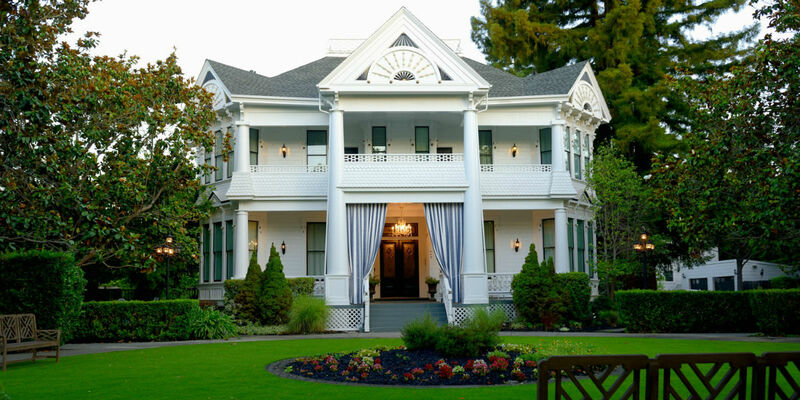 Insider Tip: 5-6pm is the White House Napa Valley Inn’s daily wine social. Enjoy sips from local wineries without leaving the grounds after a very productive day of lounging and catching up with your favorite book. If outdoor relaxation is not your ideal, their ample on-site spa services may be the ticket. Offering a selection of options ranging from nail care to deep tissue massage, the White House Napa Valley Inn’s courteous staff can help choose the best package to soothe tired bodies and rejuvenate your senses. Grab a service solo or lavish with your special someone, and treat yourself to some much deserved pampering. Insider Tip: Want to feel refreshed and invigorated? We recommend a Massage with Facial Treatment. Enjoy the touch of a seasoned massage therapist as they target tension areas, release pressure and stress, and then enjoy an aromatic facial with all the fixings. You don’t need the vineyards to explore the fruits of wine country’s labor. Park your car and explore the walkable, picturesque downtown Napa. Experiencing quite a renaissance, downtown Napa’s world-class restaurants, sensational tasting rooms, and the fun of wine country is just steps away! Foodies rejoice! Whether it’s grabbing a snack between tastings or sitting down to take in the atmosphere and a meal befitting of your fine tastes, we have the spot for you. The vibe of this classic French bistro is a little bit rustic and a little bit romantic. Located in a historic 1890’s ship chandlery and overlooking the Napa River, enjoy lunch on the patio and take in the afternoon breeze. We recommend the Spring Pea Tartine and you can do no wrong with fries and a gin and tonic crafted with their housemade tonic. Italian’s specializing in Italian cuisine? Count us in! Leveraging local, organic ingredients and serving up traditional authentic pastas, meats, and pizzas, Ca’Momi is our go-to for all things pasta and if we’re honest…all things edible! Stop in for their Happy Hour for specials on their “heartcrafted” wines and beers. A 2016 Open Table Diners’ Choice Winner, Miminashi is warm and cozy, and has more character than your standard Japanese izakaya hot spot. Vegetarians and carnivores alike can partake in their ample menu of yakitori and if that’s not your bag, try a bowl of their spicy ramen. For that after meal sweet treat, share a milk soft cream on your walk back to White House Napa Valley Inn. For all Napa has to offer in one location, Oxbow Market is your stop. For coffee, local beer, oysters, fresh produce, cupcakes, books, cheese, ice cream, spices, and the list goes on, and on, and on. Great for lunches and picking up special presents to take home to your loved ones or to keep for yourself. Sip and savor the creme de la creme of Napa. From flavorful wines to playful pairings and colorful tasting experiences, when it comes to drink, we have it all. Sometimes less is more and at JaM Cellars it’s the truth! Offering only three wines, Butter Chardonnay, JaM Cabernet Sauvignon, and Toast Sparkling, this tasting room is approachable, playful, and downright delicious. Sink into one of their lush leather couches and see for yourself why the NY Times ranked JaM as one of their top places to visit in 2017. Double the fun with two downtown tasting rooms for Mark Herold Wines. Pull up a bar stool and sip on one of his spicy Cabernet Sauvignons and get to know their friendly staff. Consistently one of the most well rounded wine lists, full of delightful wine surprises. This is a relaxed, irreverent tasting room. With an 18-page wine list, and an assortment of over 40 wines by the glass, artisan beers, and BBQ served until midnight, Bounty Hunter Wine Bar can do no wrong. Celebrating the many flavors of Napa and beyond, stop in for a casual snack and flight, or dig in deep as the serve up all things BBQ. There’s no rule book when it comes to perfect pairings and Bounty Hunter suggests a flight of reds to complement that rack of ribs you just ordered. No work and ALL play, here’s some suggestions for adventuring both in and out of town. If you’re looking to grab a little something as a reminder of your trip or perhaps needing to pick up some must-haves while in town, Napa truly has it all at your fingertips. With central shopping locations like Oxbow Market, stores spotlighting local artisans and wares like Napa General Store, or casual window shopping on Napa’s relaxed riverfront, your needs are easy to find or leisurely explored. Napa is known for gastronomical prowess and adventurous chefs and is a powerhouse for both culinary adventures in and out of the kitchen. Explore your skills or step up your daily repertoire with a cooking course with Cooking with Julie. Classes range from themed Saturday classes to hands on classes alongside the local Farmer’s market. Book early to ensure you can save a spot for your cutting board. Up, up, and a way. Take in next level vineyard views with Napa Valley Aloft. No need to put that cell in in-flight mode as you’ll want to capture all of these sites and memories from your basket in the sky. Directions: From San Francisco, take US-101 N across the Golden Gate Bridge for 30 miles until you reach CA-37 E Napa/Vallejo. Take the CA-37 E until you reach CA-121 N towards Sonoma County. Turn left onto CA-121 N and continue for 10 miles. Continue on CA-29 N to CA-121 N/W Imola Ave. Take exit 16 towards Lake Berryessa. Follow CA-121 N/W Imola Ave, turn left on S Coombs Street, follow for .7 miles and then turn right onto Laurel. The next left is Brown Street and the White House Napa Valley Inn will be on your left.